Malus Pink Glow is a popular early-flowering crab-apple, the profuse white blossom appears quite early in the spring, and it is a good pollinator of early-flowering apple varieties. It is named after the large deep pink crab-apples, which form in late summer. This is also a good variety for making crab-apple jelly - the fruitlets are easy to handle and have a good pectin content. Our 2-year Pink Glow trees will usually produce blossom in the first spring after planting. Please fill in the details below and we will let you know when Malus Pink Glow crab apple trees are back in stock. 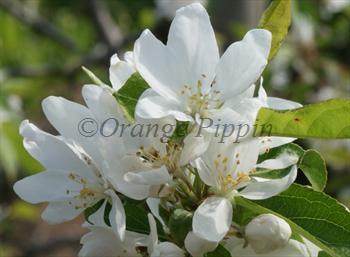 Malus Pink Glow is in flowering group 2. Malus Pink Glow is self-fertile and does not need a pollination partner, although fruiting may be improved if there is a compatible tree of a different variety nearby. 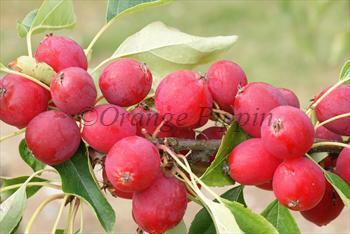 Malus Pink Glow will grow successfully in most situations and climates. It is exceptionally cold hardy, and therefore a good choice for areas with colder winter climates. Malus 'Pink Glow' was discovered in St. Petersburg, Russia, at the end of the 19th century. It is often known as Malus 'Dolgo'.